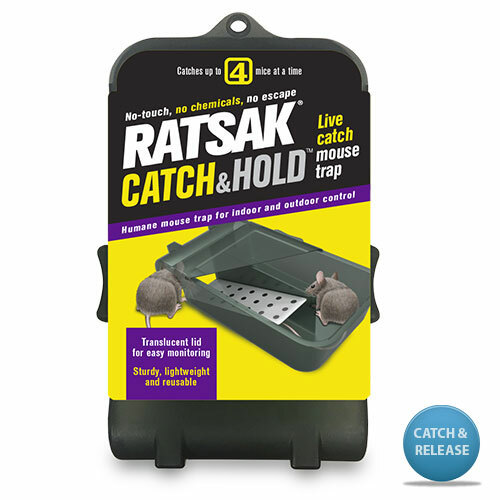 RATSAK® Rat Trap is a reusable trap with serrated jaws for a poison free rodent control solution. The fastest kill RATSAK® formulation available! RATSAK® Fast Action wax blocks are moisture resistant, making them ideal for damp or dry areas. 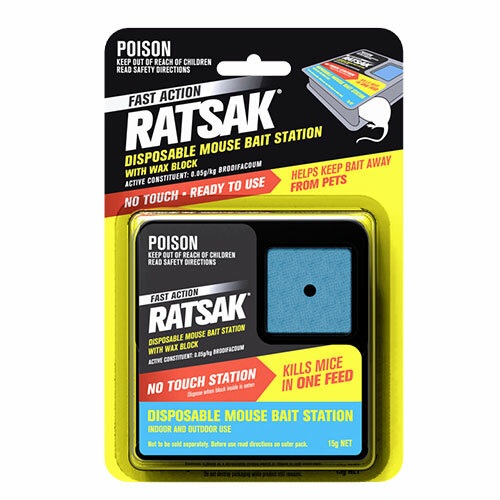 The active ingredient in the bait will kill rats and mice in a single feed. RATSAK® Fast Action also comes in individual chew-thru throw packs, ideal for hard to reach places and there is no need to touch bait. 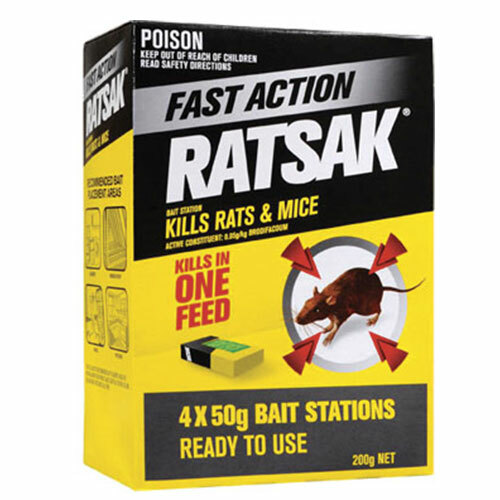 RATSAK® Fast Action is a single feed pellet bait in a ready to use bait station, so no need to touch bait. 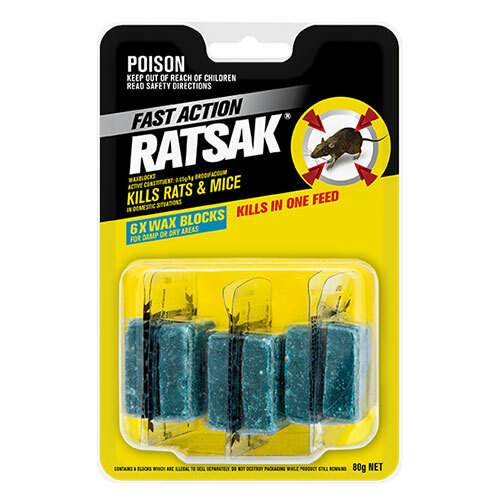 The active ingredient is the bait kills rats and mice in a single feed. RATSAK® Double Strength is a multiple feed pellet bait in a ready to use bait station, so no need to touch bait. The original trusted formula reduces the possibility of secondary poisoning to pets and wildlife. A no touch pre baited station. Simply place where signs of mouse activity have been seen, and throw away after the bait has been eaten. It's that simple! RATSAK® Rapid Strike Advanced Soft Bait combines 2 active ingredients for a fast and effective kill. Plus an added attractant to lure rats to the bait. 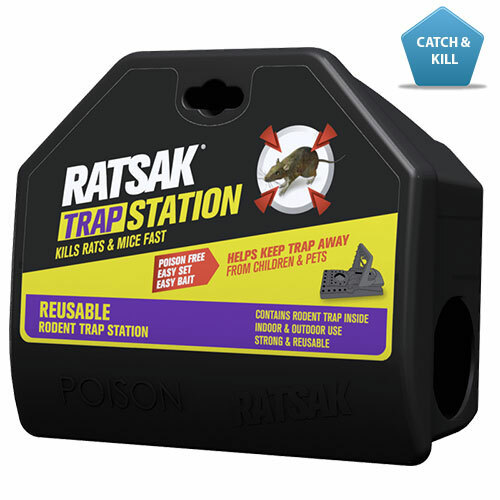 RATSAK® Reusable Rodent Bait Station is a ready to use, pre-baited station for rats and mice. Plug into your home to repel rats and mice.Emits high frequency sound waves to repel rats and mice. Mini size for maximum coverage! Plug into your home to repel rats and mice. 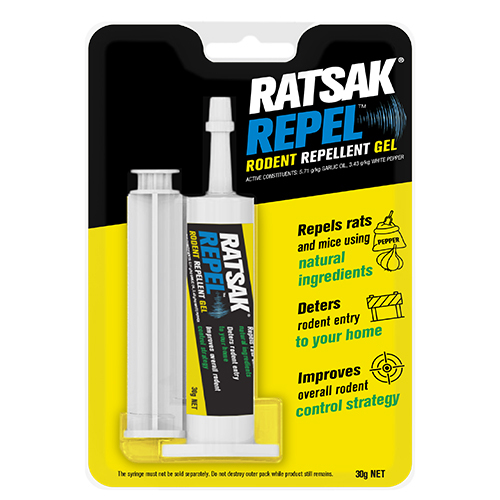 RATSAK® Repel Rodent Repellent Gel helps to repel rats and mice before they even enter your home.